I did not watch the fight the other night. I had my reasons but I have many friends and family that did. One friend (Greg) in particular who loves Conner McGregor and MMA was really into the whole event. He’s a great guy! After the fight he immediately called me insisting that McGregor did better than anyone had expected and said how proud he was of him. I’m a professional boxing coach so it was natural he wanted to share his opinions with me. Leading up to the fight he would call me regularly to talk about the event and to ask my opinion. I would tell him I didn’t feel McGregor had much of a chance but that never seemed to satisfy him and each time we talked he wanted to really get into it…to be honest, I was just not that interested. It wasn’t just this friend, it was many friends and even some family members who wanted to talk about it and this conversation was repeated many times leading up to the big event. I tried to stay clear of it as best I could because it was clear most of the folks I was speaking to were not really interested in my view but rather on telling me their’s and why my view was so wrong. Its natural. It’s the hype. If’s fun to speculate and to be part of the excitement building up to any big fight. Besides, I’m a boxing trainer so who else would they call…right? I had many opportunities to see the fight but I chose to stay home. After the fight was over my friend Greg called me immediately asking my opinion. I told him I hadn’t seen it and he went on to describe it to me. He was so happy! He felt that despite the fact that McGregor had been TKO’d that it was somehow a justification of CM’s authenticity as a capable boxer. He kept saying “see…see…CM did better than you all thought he’d do…see…MMA fighters can compete with boxers.” I did not respond because it was unnecessary since his guy was just TKO’d for gods sake and didn’t feel anything else was needed to be said at that moment. Besides, he was having fun in the moment so it was not the right time to offer a contrary opinion. So the next day I crafted a brief email for him and I wanted to share it with you all in the hopes some of you find it interesting. Dear Greg: I was very happy for you last night. When you called you seemed like you were having a ball! It sounded like a fun event. As I mentioned, I did not see the fight and I had watched the Miguel Cotto fight on HBO instead. I know you are a big fan of Conner McGregor’s and you should be very proud of him. He is a true warrior and an impressive guy, to say the least! That said, I wanted to try and share my thoughts on the fight and avoid a disagreement in the process. I hope you will take what I offer in the spirit in which it is intended. After so many years in boxing I have a point of view you may find interesting. I didn’t say anything last night when you called but I’m hoping that by today some of the euphoria has worn off and I can share my point of view and give you a different perspective on the fight. There was no surprise last night Greg. I know you want to believe CM ‘shocked the world” but he did not. He did not outperform expectations and, in fact, got KO’d and was saved by the official. Not only did CM NOT outperform expectations but he actually performed almost EXACTLY the way many (most) knowledgeable and smart boxing folks felt he would…GIVEN THE CIRCUMSTANCES. Look I do not claim to know much, but I do know boxing. Over the years I’ve learned not to let my emotions cloud my judgment and I’ve learned how to “tease out” the hype for the actual fight itself. In any build leading up to a fight everyone loves to speculate, make predications and defend whomever they are backing. That’s half the fun of it and this fight was no different, however, next time if you REALLY want to know what the inside experts think about it all you have to do is follow the money. Simple! The HYPE or “the FOG of war” so to speak was awesome for this event. MMA vs Boxing….McGregor’s toughness vs Maywether’s skills. McGregor: the young strong warrior, in his prime, tough as nails, a big heart with a big punch and some boxing skills vs. Maywether: the undefeated super skilled boxer closing in on his 50th win. A super skilled fighter who is older and slower and who has been inactive (2 years) and has just 1-KO in the past 10 years – its perfect and when you add in the commentators from each side some saying McGregor will get KO’d in the 1st round or that McGregor won’t land a punch while others claiming McGregor was too strong, too big and has a huge punch that will crush Maywether’s “tiny” head. Everyone had an opinion and everyone was an expert. It was a BLAST! All this makes for fertile ground for a hype and THE PERFECT SET-UP!. A world-wide controversy with a nearly 100% predictable outcome! The perfect set up for a SPECTACLE…but not a real fight! Last night 83% of all the “smart money” (professional gamblers) bet on Maywether. The over/under on the fight was 9.5 rounds (the fight went 10. 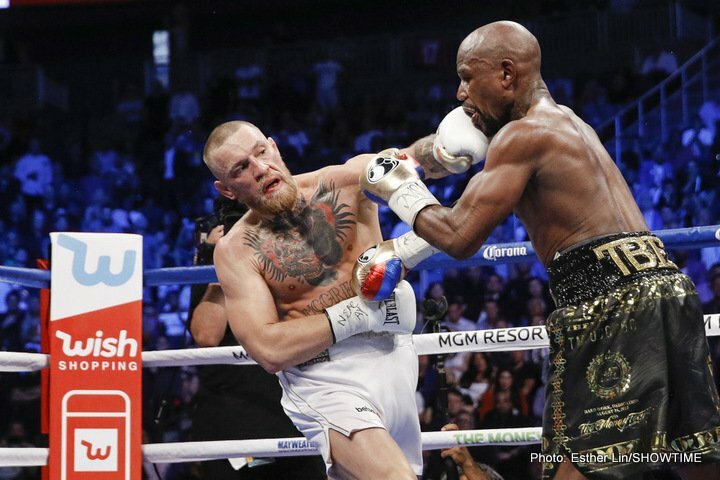 Six weeks ago I penned an article called “A Coaches View on the Maywether vs McGregor fight’ where I predicted this fight would turn out almost EXACTLY as it did. I’m no genius but I do know a few things about boxing and the “big hype.” The fact is, McGregor and Maywether each performed almost EXACTLY the way most of us expected they would. In fact, the only people who are truly shocked were those of you who bought into the hype. Here are the facts (if you care to hear them)-: Conner McGregor is a world-class MMA fighter with “club level” talents as a boxer. His youth, heart and size kept him on his feet just long enough for Vegas and the “smart money” to cash in (Under/over 9.5). He had almost no chance to win the fight and he performed EXACTLY as the money had PLANNED. Maywether did the same and everyone walked away a winner last night. That said, this was NOT a real fight….. it was a spectacle!!! Greg, I love to see you so excited about a boxing match. That said, next time there is a big hype DONT just “watch” the hype but rather try and SEE THRU THE GAME! McGregor is a very bad man who performed EXACTLY as he was expected to. Maywether is a great OLD boxer who did EXACTLY what he needed to…everybody wins…including the fans on both sides. McGregor cashed-in at the right time against the perfect guy. The truth: McGregor is a club-level boxer, nothing more…nothing less, but his other attributes made him the perfect foil for the hype. McGregor was exactly what he was expected to be and exactly who he needed to be last night. GET IT! Be proud of your man, he’s great in MMA but he should NOT return to boxing! Ole PT would have been proud Saturday night! See you at the gym Greg! You are here: Home / Boxing News / MayMac: P.T. would’ve been proud!